One of the many fascinating things that Inspector John Vance packed away when he retired from the Vancouver Police Department in 1949, were several true crime magazines. He appeared in all of them. Reporters were intrigued by this scientist who was able to convict criminals through the tiniest piece of trace evidence, and determine death through his forensic skills in serology, toxicology and firearms examination. Reporters moonlighted for these magazines and had cozy relationships with police and sources that gave them access to information and photos that were from https://www.salesforce.com/products/service-cloud/help-desk-software/ unheard of on any crime beat today. The early magazines ran fictionalized versions of sensational crimes. In one ironically called Real Crime Cases, Vance takes a starring role in a story called the “Mystery of the Missing Mrs. Millard” based on a 1914 murder investigation. The case is the first chapter in Blood, Sweat, and Fear: the story of Inspector Vance, Vancouver’s first forensic investigator, and it’s fascinating to read the “real” version in the magazine. In the magazine, Vance becomes a detective and is even given lines and solves the case. In reality, it was the first police case he worked on, and his job was to test a stain found on the carpet to see if it was human blood. In another case that I wrote about in Blood, Sweat, and Fear, the story of two murdered police officers in Merritt written up in Master Detective was so detailed and accurate with accompanying crime scene photos, that it resulted in a sharp warning from the trial judge. 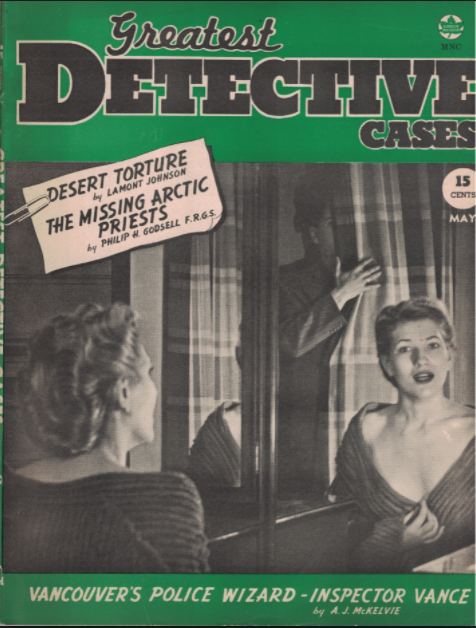 According to a Vancouver Sun story the Canadian market for detective magazines came to an end when “moral outrage led to a 1949 Canadian law banning pictorial depictions of the commission of crimes real or fictitious,” sucking all the fun from the articles. Detective magazines had a longer run in the U.S., they lasted into the 1970s. True Detective, which launched in 1924, managed to hang on until 1996. While interest in true crime never waned, tabloid television replaced the magazine.